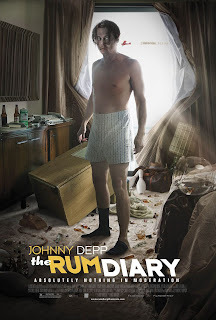 Let me be the first to say that I have never seen "Fear and Loathing in Las Vegas" in its entirety and so that first, early incarnation of Hunter S. Thompson that Johnny Depp took had no impact on me as I viewed "The Rum Diary". This film, unlike the previosuly mentioned one is actually based on one of Thompsons earliest novels that wasn't published until 1998. It feels more a small chapter out of an autobiography than a complete story though. It even says just before the end credits roll that this is indeed the end of one story and the beginning of another. It might have been better for the audience had this been combined with that story that follows. While I enjoyed aspects of this movie, and besides having Depp as the headliner there is a great supporting cast here as well. Still, this is unable to translate anything more than a handful of moments that periodically bring life to a rather standard story line. Depp gives it a good go, that is clear but the urgency with which the story is told, the originality, the poignancy, the wit and brains that seemed to exude in Thompsons writings doesn't seem to translate to the screen in a way that is as impressive as I'd hoped it to be. (Johnny Depp) about his drinking habits. 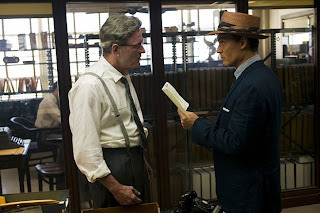 The story follows Depp's take on Thompson who is here called Paul Kemp as he arrives in Puerto Rico to take a writing position at a failing news publication. It is here we first meet Richard Jenkins (doing a great job with a small part as usual) as the editor, Lotterman. Depp's Kemp also encounters Sala as played by Michael Rispoli and as they hit it off pretty well they decide to room together after Kemp gets kicked out of his hotel for drinking one too many mini's on the newspapers tab. Rispoli has an inspired character here and for as many loose strings as this story leads us down the only real guidance seems to come from Sala as he keeps up with Kemp and in a way gives us a tour through Puerto Rico as he does with Kemp. The two share their dump of an apartment with another writer at the newspaper who only shows up once a month. As played by the somewhat over the top Giovanni Ribisi, Moburg is a man who's brain has been lost to the drink and to drugs. He offers up the more off the wall moments that you expect when seeing a film based on a Thompson work, but the problem is they almost feel out of place as the rest of the film is so by the book standard. Kemp stumbles into the company of Sanderson (Aaron Eckhart), an American entrepreneur looking to turn the beautiful parts of the island into a major cash flow and convienently needs Kemps help to run good advertising for him. The plot never gets as dirty as it should, and the underdeveloped love story between Kemp and Sanderson's gorgeous girlfriend Chenault (Amber Heard) feels way too tacked on to be neatly resolved by a line of text before the credits. and his girlfriend Chenault (Amber Heard). It may sound like I am almost disgusted by the film, but that isn't entirely true. 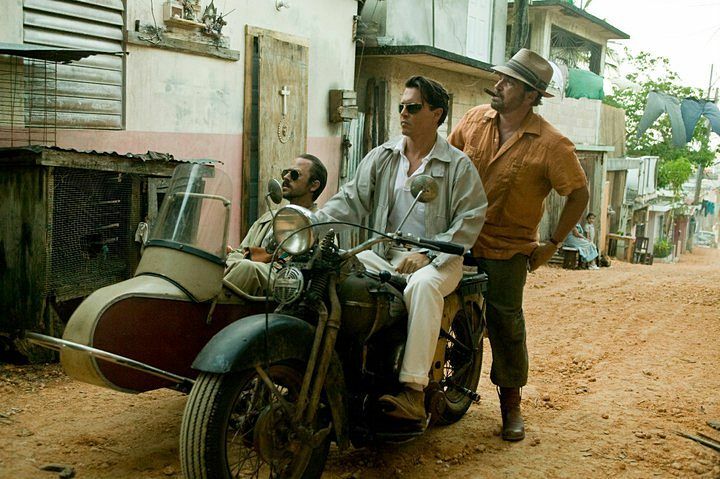 Depp and Rispoli have a few great moments, especially as they exit a local cafe that refuses to serve them food. The site of Depp breathing fire and riding atop Sala as they galavant down a Puerto Rican street in an old busted up car is priceless. They are bits of comedy that are well executed and though I have never seen any other of writer/director Bruce Robinson's films it is clear he is capable of capturing a tone and working with his actors to have them compliment that tone. Where the problem lies is in his standard storytelling style that does not in fact match the tone. The hot, sticky atmosphere of Puerto Rico is captured in every frame and that greasy greed exudes from Eckhart's Sanderson while the drunken haze, that gritty existence is given shots of life every time Depp and Rispoli get together. It is almost unnatural the way their actions don't match the reputation. Eckhart is an able actor, but his Sanderson should be much more menacing, a figure that epitomizes corrupted power and a real enemy that we want our protagonist to take down. Instead, he almost comes off as a harmless rich boy who is going to run to daddy if his plans don't go well and his peers don't do as he tells them. There is a sense of emptiness to the film as it slams on the breaks and concludes abruptly, leaving us not necessarily with a yearning for more, but with deflated dreams that the film as a whole was going to reflect the energy we were given in the trailer. (Michael Rispoli) and Moburg (Giovanni Ribisi). The film, for me, almost is the pinnacle of something you expect too much of. That Thompsons reputation precedes him and gives you such high expectations of the zaniness that will surely ensue in a story that once you actually experience it and realize, "I guess they are only human and their adventures had to be some kind of relatable." you are, in more ways than one let down by the final product. But more than being let down, I was dissapointed. Dissapointed that this did not live up to not the standards, not even the expectations, but the whole level of who this guy was as a person. Depp is one of the most famous people on earth, and has become so making off the wall characters acceptable in mainstream society. With the reputation "Fear and Loathing" has I expected Depp's own reputation to prove true when he translated Thompson to the screen as well. And while I am still interested in some day viewing all of Depp's aforementioned venture into Thompson land, I have to say this didn't exactly up my excitement for what I will be seeing. Though Terry Gilliam was probably much more experimental than Robinson has treated "The Rum Diary" there is still an aspect of Thomspons writing that you can't take away from the material. That is what this film is missing, it just needs that extra bit of gonzo.